No one can deny a delicious burger. Even health fanatics everywhere can be impartial to a juicy burger with all the trimmings. Sydney is known for it’s brilliant dining experiences, so naturally there are going to be some incredible burgers in and around this amazing city. Because there are so many places to dine, it’s hard to know where the best burgers can be found. But, fear not, for we have painstakingly (ahem!) dined out across the city in search for the best burgers in Sydney. While it was hard to narrow down the list as there were so many great choices, here are our top burger picks. Chur Burger have a number of locations across Sydney, Brisbane and Melbourne and it’s not hard to see why. We dined at the Surry Hills location and were certainly not disappointed. From grilled lamb, pulled pork and classic beef patty selections, there is something on the menu for all tastes. If you’re looking for double meat, or added bacon, it can certainly be arranged. Follow your burger down with a milkshake (which can have an added shot of alcohol if you prefer) to really top off your meal. Out at Crow’s Nest is the legendary Hayberry. There is no takeaway option, s you will have to dine in, but that’s certainly not an issue. With a lunch and dinner menu that is superb, they have some great offerings and sides. Their signature wings and loaded fries are truly delicious. Our pick was the Borderlands burger. which was stacked with chilli beef, sour cream, jalapenos, lettuce, cheese and spanish onion and was a meal we’ll definitely be going back for. The Grand National in Paddington isn’t just about burgers. They serve typical pub favourites like steak, pies and chicken schnitzels, but the real crowd pleaser is their Famous Nash Burger. The medium-rare patty with melted cheddar, a bit of salad, caramelised onion and smoky savoury tomato relish will tantalise the tastebuds. Added to this their overly-tasty bearnaise sauce and this burger is an absolute treat. Over at Ashfield lies Excelsior Jones. They have plenty of options to choose from on their menu, including a delicious kids menu. There are often fresh donuts available and their (all-day) breakfast is always on point. Their burger is, however, a classic. Using grass-fed Angus beef, cheddar, smoky tomato relish, dill pickles, tomato, iceberg lettuce and their house burger sauce, it’s everything you would ever look for in a classic, burger treat. When you think of burgers, you might be thinking juicy beef patties and bacon. But, you won’t be getting that at Soul Burger. Soul Burger is entirely vegan and before you write it off, you need to know that the burgers here are actually quite epic. Even the biggest carnivore’s amongst us will be delighted with the burgers here. In fact, the burgers truly are that delicious, you probably won’t even miss the meat. Some have argued that Mister Gee’s is the best place to get a burger in the whole of Sydney. Their burgers change weekly and will often be found in Haberfield. But, they can sometimes crop up in other areas on one-off occasions. There is generally always a queue to get your hands on their delicious burgers and sides, so be sure to be prepared for a wait. Not only do these burgers look amazing, they’re incredibly tasty despite being created in a food truck. You can track what burger they will be serving on their Facebook page, as well as any additional appearances across the city. As a side note, you can ask for an extra patty for just $3 extra, which is definitely worth every cent/bite. If you’re looking for a takeaway fix but also want to be more ethical in your choices, you cannot go past Lord of the Fries. The entire menu is kosher, halal and vegetarian, with vegan and gluten free options also available. Their original burger is just like a classic American cheeseburger (almost), plus there are some extra exciting burgers on the menu for those who are a little more adventurous such as the “Phish” burger and the “Poutine” burger, featuring “fakin’ bacon”. Don’t forget to top off your burger with their classic onion rings and a vegan Oreo cookies and cream milkshake. If you’re in Ultimo, you must check out Pub Life Kitchen. As well as burgers, they have the standard pub meals that you would know and love. Where they really do well is with their range of burgers on the menu. If you’re looking for something a little different, head over on a Wednesday night, because this is their experimentation evening. Their latest creation was a Tex Mex burger, complete with corn crisps, salt aged beef patty, corn, pineapple salsa, cheese, cabbage, lime and avocado aioli and chipotle spiced frisole. If you’re looking for something a little different, or perhaps a classic American-style beef burger, you can find it right here. There are five burgers on the menu at BL Burgers, with a special that is announced over on their Facebook page, but if you want a decent burger, just head straight for the Blame Canada burger. It includes your standard beef patty, maple glazed streaky bacon, American cheddar, poutine and maple aioli. Things might get messy, but trust us when we say it will be totally worth it. Their other burgers looked rather appetizing as well. There isn’t any alcohol served here, but due to their location on Oxford Street, there are plenty of other facilities nearby where you can get an alcohol fix should you be looking for one. You don’t have to be a meat-lover to enjoy a hefty burger. As we have seen at numerous burger joints across the beautiful city of Sydney, there are some very surprising vegetarian and vegan burger options for those who want a more ethical food choice. 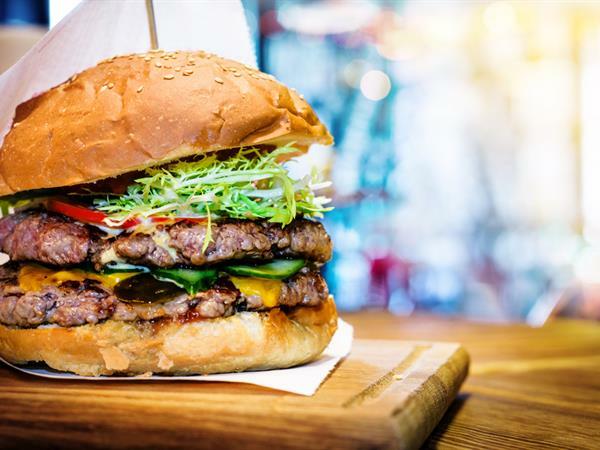 Whether you eat your burger alongside your favourite milkshake (or soya shake), beer or alcohol infused milkshake, there are many great burger places in Sydney. No matter what your tastebuds want, check out some of our favourite burger places mentioned above for a feed you won’t forget.